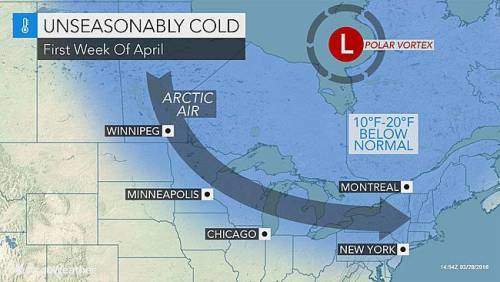 AccuWeather Global Weather Center-(ENEWSPF)- AccuWeather reports a southward plunge of the polar vortex will bring a quick blast of arctic air directed at the Great Lakes and northeastern United States during the first week of April. 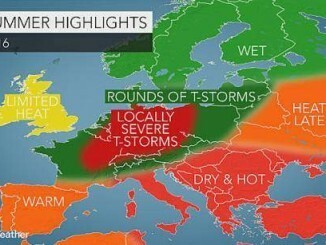 “The latest indications are the core of the coldest air associated with the polar vortex will track a bit farther north and east, compared to the outlook from last week,” according to AccuWeather Long-Range Meteorologist Edward Vallee. The main thrust of cold air will aim at the Great Lakes, New England and the northern part of the mid-Atlantic. There is still a chance the arctic air may sneak farther south at the last minute, according to AccuWeather Long-Range Meteorologist Joe Lundberg. It is possible for frost and freezing temperatures at night in parts of the central Plains, Tennessee Valley and southern Piedmont areas at the height of the cold air. The potential for shocking cold and a hard, damaging freeze will exist from the Upper Midwest to the interior Northeast. In many cases, fruit trees and bushes have been budding and blossoming two to four weeks earlier than last year. For example, the cherry blossoms in Washington, D.C., reached peak on March 25 this year, compared to April 10, 2015. The average peak bloom date is around April 4, according to the National Park Service. Much higher temperatures this winter, when compared to average, helped to produce the earlier bloom. Highs may be in the 20s and 30s F during multiple days from western and northern New York state to central and northern New England. AccuWeather RealFeel® Temperatures can be 10-20 degrees lower than the actual temperature at times. The duration of the cold air will be abbreviated in much of the Midwest and southern Appalachians. “Instead of a week’s worth of arctic air, there may only be three to five days, on average, where temperatures are 10-20 degrees below normal in the northern tier,” Lundberg said. Normal highs during the first week of April are in the lower to middle 50s in Minneapolis, Chicago and Boston, the upper 50s in Pittsburgh and New York City, and the 60s in Philadelphia and Washington, D.C.
As the arctic air passes over the open waters of the Great Lakes, rounds of lake-effect snow will erupt. Typically, by April, lake-effect snow events are insignificant. However, since the air will be much colder than the water, bands of heavy lake-effect snow can set up downwind of the lakes. 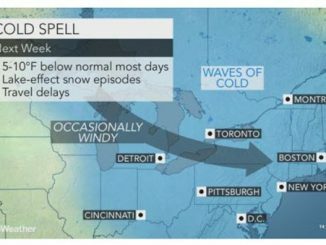 “This is the type of setup, where a couple of snow showers could be seen east of the Appalachians to the Interstate-95 corridor of the mid-Atlantic and New England in the depths of the cold air later this weekend into early next week,” AccuWeather Chief Meteorologist Elliot Abrams said. In addition to lake-effect snow and more distant snow showers, a couple of Alberta clipper storms may swing southeastward with periods of steady snow, well away from the traditional lake-effect snow belts. Spanning Saturday to Sunday (April 2-3), one period of snow may swing from northern Minnesota to New York state, northern Pennsylvania and New England. Another period of snow may take a similar path or track a bit farther south spanningSunday night to Tuesday (April 3-5). South of the track of the clipper storms, the cold will be significantly less harsh, when compared to areas farther north. 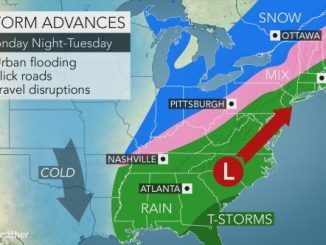 AccuWeather will continue to provide updates on the extent, magnitude, duration and timing of the arctic air.